The historic city of Winchester is no stranger to superbly run bus rallies and running days. The event you will see on this DVD programme is no exception. Planned and managed by 18 year old Daniel Raynor, it has got to be up there with the best! Part of a college course work project, Daniel and his colleagues organised this Vintage Bus Day. 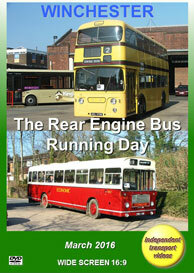 As the title suggests, all the buses featured in the running day were rear engine buses built from 1960 up to the 1990s. Vehicle types include Bristol RE, Bristol VR, Leyland Atlantean, Leyland Panther, Leyland National, Leyland Olympian, AEC Swift, MCW Metrobus and a DAF Optare Spectra. A total of six services were operated, offering connections with other services and even the steam trains running on the Watercress Line at Alresford railway station! This DVD programme also features the contemporary buses running around Winchester in the shape of Stagecoach South and Blue Star. Towards the end of 2015 Stagecoach introduced a new fleet of eighteen Alexander Dennis Enviro200 MMCs. Painted in a smart metallic purple and champagne livery they are branded as ‘The King’s City’. These new buses replaced a number of older ADL E200s and Dennis Darts. The new buses can be seen operating their normal duties amongst the excellently preserved buses and coaches on this Rear Engine Running Day. Our filming starts at the Broadway in Winchester on a bright and sunny spring morning, Sunday 13th March 2016. Moving into the bus station we see plenty of action as the preserved buses pick up their passengers to ride the services. Our cameras take their first ride of the day on board former Bournemouth Corporation Leyland Atlantean, 170 (AEL 170B). Dating from 1964 this lovely bus takes us to Otterbourne and back, where we pass a number of buses along the way, both preserved and contemporary! From the Broadway we now join former Southdown Bristol RESL6L, 490 (TCD 490J) for a ride through the Hampshire countryside to the pretty town of Alresford via Itchen Abbas. At Alresford we are just in time to see a ‘Schools’ class locomotive steam into the railway station! Our cameras now board former Economic (Busways, South Shields) Bristol RELL6L, 1802 (TRY 118H). This interesting ECW bodied RE started life with Leicester City Transport as a dual door example. Later it moved to Ipswich, before ending up in the north east of England! We journey back to the Broadway via Itchen Abbas to capture further action before travelling to Winchester railway station. We travel on a Damory Coaches DAF Optare Spectra, 1655 (R155 NPR) a bus still in everyday service, originating with Damory Coaches parent company, Wilts & Dorset. This concludes an excellent day and event – well done Daniel! The next two sections of this programme take a look at the contemporary bus operations in the city. Our first visit is in August 2015, with weekday filming locations in City Road, Jewry Street, St George's Street, Silver Hill and the Broadway. Stagecoach and Blue Star are the main providers of the services. Our next visit is a week after the Running Day, in March 2016. Here we catch up with the weekday operations in similar locations, but add the bus station for extra interest. Here we see ‘The King’s City’ vehicles in service alongside ALX400 and E400 double deckers and some elderly Volvo Olympians! To keep our theme going, they all have rear engines! Enjoy.